I have my garden guru friend, Mike Hills, to thank for steering me to the Mission Garden in Tucson. I had no idea this gem even existed. Maybe you don’t know about it either, so hoping I can pay forward the nudge I received from Mike to make a visit! Nestled at the foot of Sentinel Peak - known today as “A” Mountain and the birthplace of Tucson, there is a four acre garden that not only connects you to the earth, but provides an open air agricultural history lesson tracing back to the origins of the first Paleo Indian people who inhabited the area thousands of years ago. You might just drive on by as it is completely hidden behind a simple span of adobe block wall. How many cars just zoom past it and miss out on the wonder that awaits as you step into the garden beyond the two imposing mesquite wood plank gates? Everything about this space spoke to my garden girl soul. The understated elegance of the entrance, the potager inspired layout and the steadfast effort to get it right by preserving the agricultural heritage in real time vs. just showing us pictures in a museum is exactly how to marry together the cultural, historical and agricultural importance of this sacred land by the Santa Cruz river. Re-created after the Spanish colonial walled garden that used to sit next to the San Agustin Mission around 1693, you’ll first find an orchard with old world fruit trees bearing quince, pomegranate, figs, peaches, and vintage grape cultivars. From there you can meander around the other “timeline” gardens providing a look at what people were growing in this same spot over thousand of years. The ten other Timeline Garden themes you can explore are: Native Plants, Early Agricultural 2100 BC, Hohokam 500AD, O’odham 1450, Mexican Garden 1821, Chinese Garden 1870, Anglo Garden 1854, Yoeme (Yaqui) 1890, African American 1860, and Tomorrow’s Garden 2017. 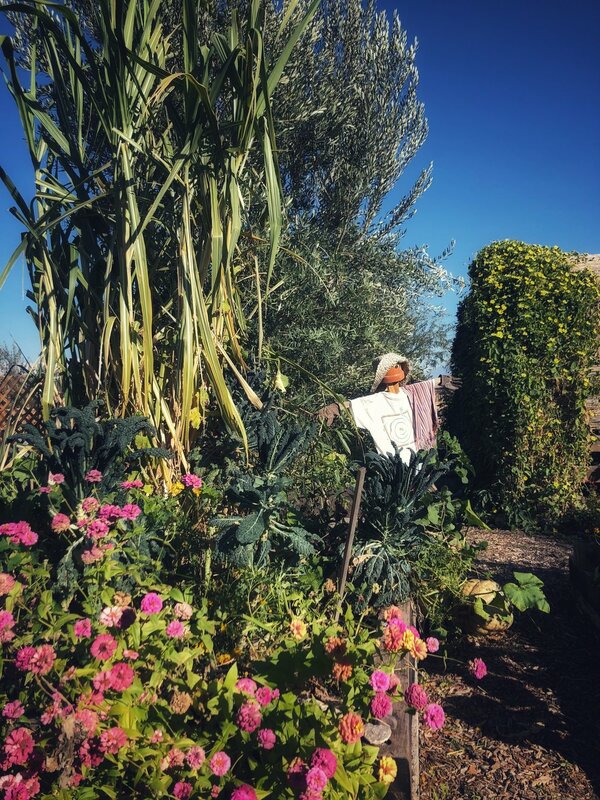 In addition to the gardens there is demo kitchen, exhibit space and education center, where I was thrilled to find a stash of crops that were harvested and set out to dry. 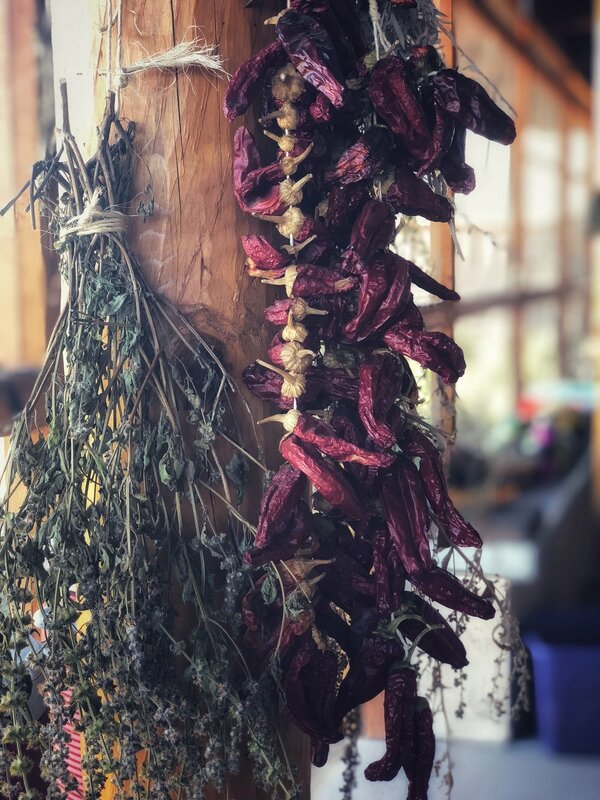 From garnet red roselle flower sheaths to neolithic looking seed pods of Devil’s Claw and ristras strung with scarlet red and burnt orange chilis - the screened in porch was brimming with the bounty of a recent harvest. You should check out the offerings of education and events before visiting as you might regret missing out of the recurring classes and special events offered throughout the year. The garden is open Wed-Sat 8 am - 2 pm . April-September 8 am - Noon. You can schedule a tour in advance - which I will do the next time I head down! Kudos to The Friends of Tucson’s Birthplace, a 501 (c) (3) organization, to their dedication to preserving, honoring and protecting the cultural heritage and historic landscapes of Tucson’s birthplace. You bet I’ll be back for a visit throughout the seasons to see what is growing and what I can learn from the ancients who nurtured and cared for the soil here before me. 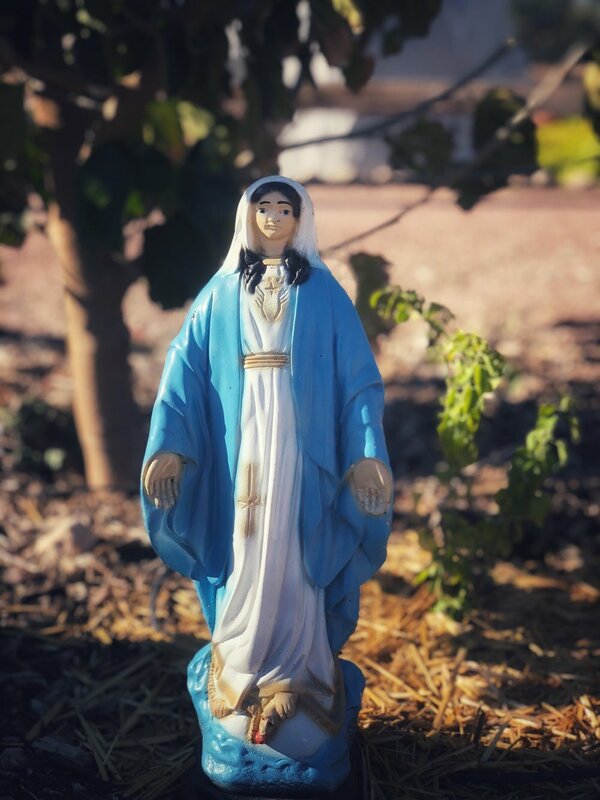 This is a soul garden that should not be missed when you visit the Old Pueblo, Tucson!